We'll be attending the SuperBike races at Mid-Ohio this Sunday, July 20th. You can find more information on this event and tickets here. Check your email for more details. We also have a Ducs at the 'Bucks this Saturday! Please attend to pick up your 2014 Ducati Welcome Kit. Stay tuned for more information on everything Ducati at MotoGP next month! 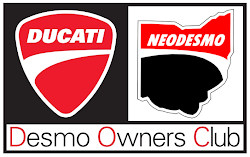 And don't forget to join the NEODESMO Group on Facebook to chat with other Members!